The Yale Sync alarm includes an extended 200m wireless range and is compatible with Philips Hue and Amazon Alexa. App notification, email and SMS alert when triggered. Alarm will accept up to 40 different components. Yale	Yale's latest smart home alarm system, the Yale Sync, secures your home and alerts you when your alarm is triggered. Each Sync Alarm is fully compatible with Amazon Alexa and Philips Hue, providing a complete smart home system. The extended 200m wireless range enables you to protect out buildings as well as your home. The intuitive wireless system has been designed with DIY in mind ensuring the Sync Alarms really are easy to fit. No wiring or running cables in walls or under the carpet and you won't need the the services of a qualified electrician. The Yale Sync Smart Home Alarm - IA-320 is a fully featured wireless smart alarm system designed to secure any type of home. 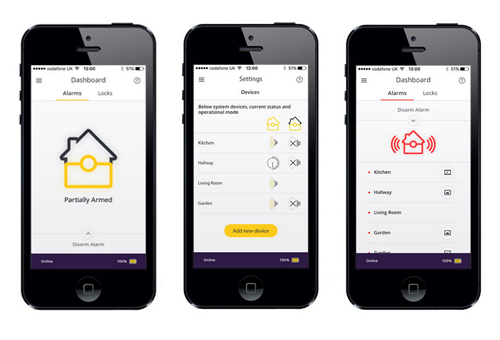 The system is controlled via smartphone and can be armed or disarmed using the Smart Home Alarm App or PIN code on the keypad. When the alarm is triggered a loud external siren will sound to alert others of an intruder and notifications will be sent directly to your smartphone. The Smart Hub with 100dB internal siren is the heart of the alarm system and is connected by an Ethernet cable (included) to your broadband router. Once connected to your router the hub connects via wi-fi to each device on your alarm system. The Yale Sync Alarms include an extended 200m wireless range which is much wider than most other home alarms and is ideal for protecting a large property. 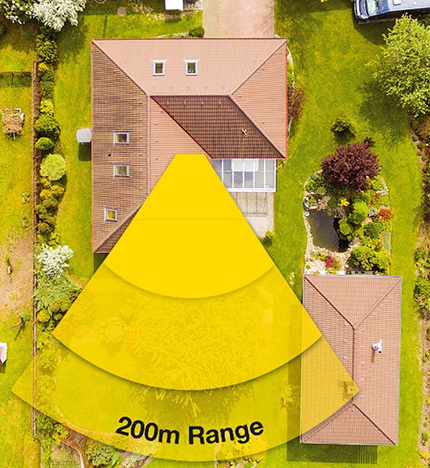 The 200m wireless range ensures it is possible to protect your home and outbuildings, such as shed or garage within one system. The alarm system will notify you by email, SMS text and push notifications if the alarm is triggered. You can access all of the alarm settings and features via the Yale Smart Home Alarm App (available for iOS and Android). The system can be activated and deactivated using your SmartPhone. The Yale Sync Alarms are fully compatible with Amazon Alexa and Philips Hue, allowing you to create the complete smart home experience. Ask Alexa to fully arm or part arm your alarm and receive status updates on your home security. * Requirements: This alarm system requires a broadband internet connection with a router that includes one free wired network port. SmartPhone must be iOS 9.0 and above or Android 4.2 and above.